This 120 m2 apartment is located on the top floor with a private elevator and has south/west terraces with golf view. It is located in a recent gated building with swimming pool, tennis and golf courses. It consists of a 60 m2 living room with a fitted kitchen and fireplace, three bedrooms and four bathrooms. Perfect condition. Parking and cellar complete this apartment! ANTIBES: In a residential area of Cap d'Antibes, within easy walking distance of the beaches of both Antibes and Juan les Pins,this charming villa with lots of character has a cathedral living room and dining room opening onto the terrace. The villa has 2 bedrooms with two bathrooms, a shower room and separate dressing room, together with a study overlooking the terrace. 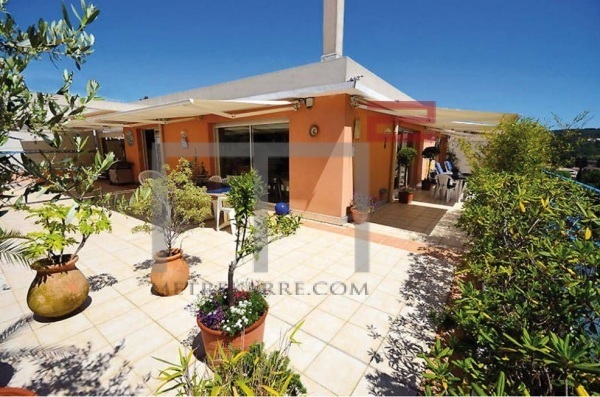 Kitchen, laundry and landscaped garden with palm trees and heated swimming-pool. Cellar, garage and parking space. Worth Every Penny. Contact us for details!